You are currently browsing the tag archive for the ‘Messerschmitt’ tag. The history of the Messerschmitt company began decades before microcars were even thought of. The German engineering company MAN AG started an aircraft-building business called Bayerisches Flugzeugwerke AG, or the Bavarian Aircraft Works. They began making wooden airplanes in World War I, moved onto kitchen outfitting in the ’20s (little bit of a change from planes, huh? ), and went back to airplane manufacturing in the ’30s. The company was eventually combined with BMW’s engine works and renamed after the manager, Willy Messerschmitt. Despite some setbacks (like a prototype killing the best friend of the head of Lufthansa and near bankruptcy), World War II broke out and Messerschmitt airplanes were selling like hotcakes. After the Second World War, Messerschmitt (along with all other armament manufacturers) was not allowed to produce aircraft. So the company turned to other ideas for revenue, and one of them was the microcar! Willy Messerschmitt himself didn’t have much to do with the creation of the Messerschmitt microcars. Fritz Fend, one of his designers, was responsible for their creation. He started building three-wheeled vehicles as alternatives to cars for the disabled, especially those individuals wounded in the war. His creations soon proved to be popular with healthy individuals, too. After successfully making his own microcars, Fend brought his knowledge to Messerschmitt. Fend made microcars from 1955 to 1964. 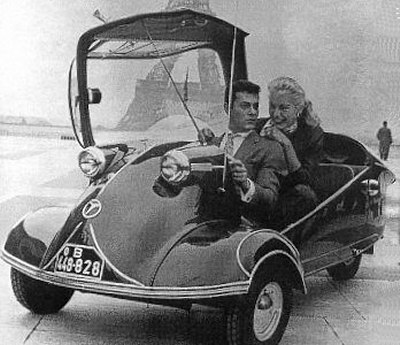 The Kabinenroller, which means scooter with cabin, was one of the more popular Messerschmitt microcars, with 12,000 built during its first year on the market. "Oh, Johnny, this is so much fun! It's just like a little baby car!"... "Hush, Linda. I'm trying to look as masculine as possible while sitting six inches off the ground in a tiny car." These microcars were so simple to operate that Fend said, “If you still had a head, you could drive a Messerschmitt.” The KR200 indeed has some unique features. Its two seats are placed in a tandem position, which means that it could be driven anywhere in the world without changing the placement of the driver’s seat. Its dome canopy has the appearance of a bubble, giving microcars the nickname of “bubble cars.” And if you look at its steering system, you’ll see it looks more like airplane controls than a steering wheel, reflecting the company’s aeronautical roots. Reverse was accomplished not by including a reverse gear in the transmission, but by reversing the rotation of the engine itself. During the time of its production, the Messerschmitt was tested in a 24 hour run. The car ended up breaking 22 international speed records for vehicles in its class. Eventually, Willy Messerschmitt lost interest in microcars and their production was stopped. Messerschmitt went back to building airplanes and the company was bought out several times. Today, what remains of the Messerschmitt Company is now EADS Germany. Fritz Fend kept working on different inventions, including other microcars, until his death in 2000.